PRofessional Solutions, LLC was pleased to serve as a sponsor of Washington Women in Public Relations’ newly created 2010 Emerging Leaders Awards program held June 15 at Social Restaurant. 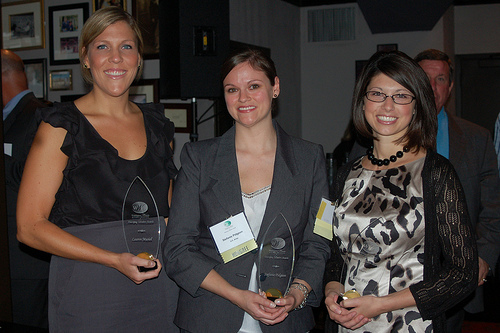 Three outstanding young women, ages 21-35, in the DC area who have excelled in public relations were recognized. The recipients were Carrie Fox, president and founder of C.Fox Communications, Lauren Musiol, senior account executive at GYMR, and Stefanie Pidgeon, a communications planner for the U.S. Army. This entry was posted in PRofessional Solutions News, Sponsorships, WWPR and tagged Carrie Fox, Emerging Leaders Awards, Lauren Musiol, Public relations, Stefanie Pidgeon, WWPR. Bookmark the permalink.